You’re in the middle of a conversation when you walk out of a quiet building onto a crowded street. A loud plane flies directly overhead. You stop your car for a passing train. Chances are, you’ve experienced these kinds of anthropogenic (man-made) noises in your everyday life. What do you do? Most people raise their voice to be heard, an automatic reaction called the Lombard effect [1, 2]. Similarly, dolphins and other marine mammals experience anthropogenic noise — from human activities such as boat traffic and construction activities — and raise their “voices” to better communicate [3, 4]. Understanding the extent to which dolphins exhibit the Lombard effect and alter their vocalizations in the presence of man-made noise is important for predicting and mitigating the potential effects of noise on wild marine mammals. In this study, bottlenose dolphins were trained to “whistle” upon hearing a computer-generated tone (Figure 1). After successful detection of a tone, dolphins typically produced a “victory squeal” (a pulsed call associated with success ). During tone-detection trials, the dolphins’ whistles and victory squeals were recorded while one of three computer-generated noise conditions played in the background (Figure 2). The dolphins responded to every background noise condition with the Lombard effect: as the noise frequency content and level increased, the dolphins’ whistles got louder (increased amplitude) (Figure 3). Other noise-induced vocal modifications were observed, such as changes in the number of whistle harmonics, depending on the specifics of the noise condition. Because this was a controlled exposure study with trained dolphins, we were not only able to exclude extraneous variables but were able to see how the dolphins responded to different levels of background noise. Control over the background noise allowed us to tease apart the effects of noise level and noise frequency content. Both properties of the noise appear to affect the parameters of dolphin signals differently, and may reflect an ability to discriminate within those properties independently. Figure 1. Hearing test procedure with US Navy Marine Mammal Program dolphins in San Diego Bay, CA. [A] Each trial begins with the trainer directing the dolphin to dive underwater and position herself on a “biteplate” in front of an underwater speaker. [B] Once on the biteplate, the dolphin waits for the hearing test tone to be presented. When the dolphin hears the tone, she whistles in response. The researcher lets the dolphin know that she is correct by playing a “reward buzzer” out of another underwater speaker. The dolphin will often respond to the reward buzzer with a victory squeal before [C] coming up for a fish reward. The dolphin’s vocalizations are recorded from the hydrophone (underwater microphone) in a green suction cup just behind the blowhole. Figure 2. Spectrogram examples of the four conditions. The [W] whistles, [RT] reward buzzers, and [VS] victory squeals of the dolphin in Figure 1 are labeled. Figure 3. Whistle Amplitude across four conditions. Compared to the control condition (San Diego Bay ambient noise), both dolphins produced louder whistles in every noise condition. Lombard, E. (1911). Le signe de l’élévation de la voix. Annales des Maladies de L’Oreille et du Larynx, 37, 101–119. Rabin, L. A., McCowan, B., Hooper, S. L., & Owings, D. H. (2003). Anthropogenic noise and its effect on animal communication: an interface between comparative psychology and conservation biology. The International Journal of Comparative Psychology, 16, 172-192. Buckstaff, K. C. (2004). 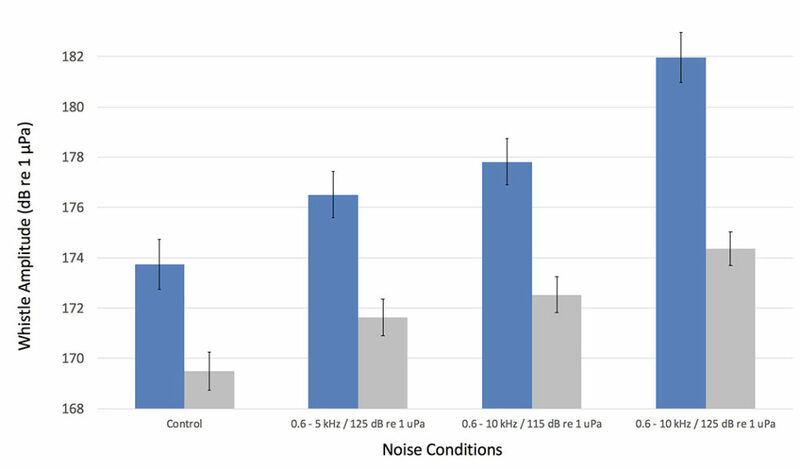 Effects of watercraft noise on the acoustic behavior of bottlenose dolphins, Tursiops Truncatus, in Sarasota Bay, Florida. Marine Mammal Science, 20(4), 709–725. Hildebrand, J. (2009). Anthropogenic and natural sources of ambient noise in the ocean. Marine Ecology Progress Series, 395, 5–20. Dibble, D. S., Van Alstyne, K. R., & Ridgway, S. (2016). Dolphins signal success by producing a victory squeal. International Journal of Comparative Psychology, 29.